This October, we’re challenging ourselves to watch at least one horror movie a day. Today’s theme is H.P. Lovecraft. 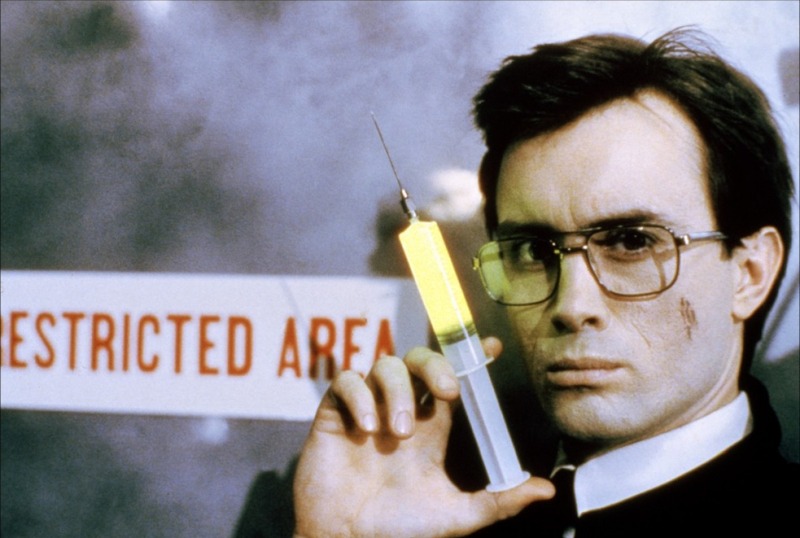 God, I love Re-Animator. It’s a film that gets better every time I watch it. Like other horror comedies discussed, it plays its gore and disemboweled organs for shocked, horrified laughs. It’s just as well because it would be a horrific nightmare of a film otherwise. The film’s tagline – “Herbert West Has A Very Good Head On His Shoulders… And Another One In A Dish On His Desk” – gives you an idea of the film awaiting you. If it didn’t, an opening involving exploding eyeballs should do the trick. Director Stuart Gordan revels in the film’s bad taste and commits so fully to its grimy, grotesque aesthetic that the film achieves a kind of bizarre splendor. Loosely based on a Lovecraft short story that was itself kind of a Frankenstein knockoff, Re-Animator initially appears to center around medical student Dan Cain (Bruce Abbott). Cain begins the film as the kind of individual who just doesn’t have it in him to give up on a patient. He just can’t accept that sometimes death is the only possible outcome. He finds himself in need of a roommate and is more than a little alarmed when thoroughly creepy, fellow medical student Herbert West (Jeffrey Combs) arrives at his door, ad in hand. Dan’s fiancée, Meghan (Barbara Crampton) tries to dissuade him from taking West up on his offer, but West can pay in cash right away and Dan’s desperate. Like the protagonist in House of the Devil, he strikes a Faustian deal because of a need for quick rent money. Then it’s only a waiting game until Herbert West reveals his plans. His serum, seemingly extracted from a glow stick, can reanimate the dead. That goes about as well as it usually does, and the film builds to a bloody climax of crazed corpses and a decapitated head, as well as his compliant body (David Gale, whose leering, creepy, long-faced character appeared semi-cadaverous even before his decapitation), that becomes the primary antagonist. That turn of events should feel unseemly and upsetting, but it’s too outlandish to take seriously. 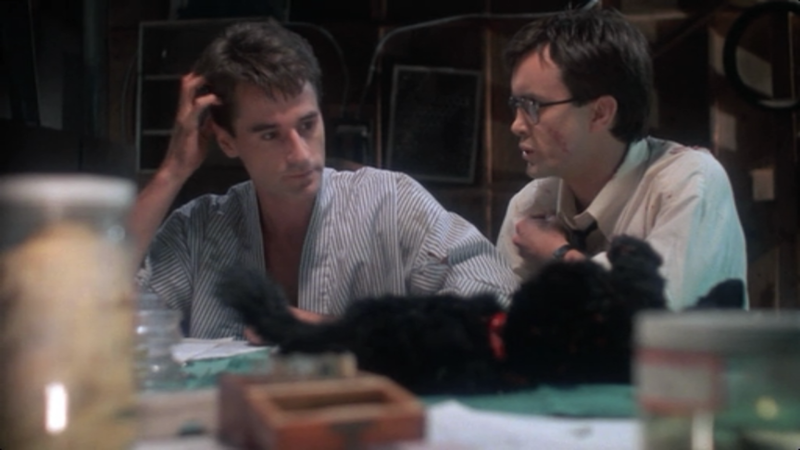 Bruce Abbott and Barbara Crampton are incredibly likable leads, even if Jeffrey Combs and David Gale overshadow them every time they share screen time. They both play the horrific absurdity surrounding them completely straight. No one tries to milk the film for comedy, instead allowing the goofy premise to service all of the best gags. No one ever gets thanked for playing a straight man, but Abbott’s grounded performance keeps the film from tipping into unwatchable hamminess. His character’s unwillingness to give up on his patients also adds a dose of the understandable to Cain’s willingness to join West in his pursuits. He’d also like a way to conquer death. He’s almost the moral counterweight to West’s unprincipled character. Grounded centers almost never get noticed, but Abbott’s essential to the film’s success. Crampton’s role really only asks her to oscillate between appropriately bubbly and appropriately hysterical, and there are times when her character is completely useless in that way many female horror characters are. She exists to place in danger, but she’s likable onscreen and has a sweet, believable chemistry with Abbott. Honestly, Re-Animator’s special effects, all appropriately gooey and tactile, would make the film memorable enough. Gordon has gone on to adapt other Lovecraft stories and make other effective horror films, but his gleeful enthusiasm for all of the gory, blood-soaked mayhem makes Re-Animator something truly special. When a severed head begins to lower itself in-between poor, naked Meghan’s legs, there’s a sense that all bets are off and there’s no boundary the film won’t cross. However, it’s Jeffrey Combs’s performance as the unapologetically amoral mad scientist that elevates the film beyond mere splatterfest. All twitchy energy and intense, contemptuous stares, Combs gets many of the films laughs without even trying. Whether he’s disrupting a lecture with strategic pencil breaks or theorizing as to what a hypothetical note would say regarding the death of Dan’s cat (“Cat dead. Details later.”), Combs is endlessly watchable, playing each scene as though his character is constantly weighing whether something will help or hinder his research. When a reanimated corpse attacks and kills, West simply sees another subject for his experiment and is only mildly annoyed that the previous attempt nearly killed him. There’s a reason Combs has gone on to become a horror icon, and it’s evident here. He’s incapable of giving anything less than a phenomenally watchable performance. Ultimately, Re-Animator works because of the giddy, imaginative gross-out gags that litter the screen and the cast’s willingness to play it straight and let the film’s preposterous setup provide most of the film’s comedy. As a result, the film becomes a gloriously strange, wonderfully outrageous feast for those who like their horror comedies served with a hearty side helping of disgust. Re-Animator is currently available to stream on Shudder. One of my most favorite movies of all time. Even if the music is a rip from Psycho.